thank you for the chuckle...both our kids did that ~your friendship means a lot to me ~ such a gift! I love the crying Santa pictures!!! Merry Christmas Jessica & Cody too. This is too funny! merry Christmas! Merry Christmas, Jessica! Have a safe & blessed celebration. that's hysterical. 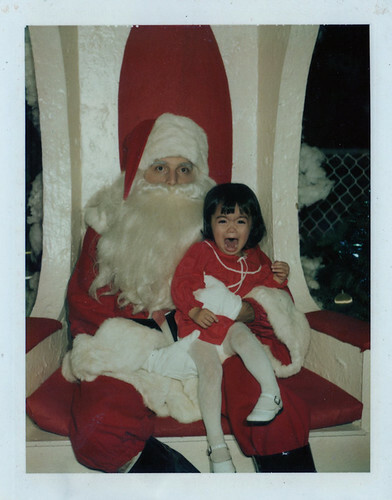 i posted old santa photos too - so funny. Hope your Christmas is merry and bright! thank you for your friendship these past few months. This photo is an absolute classic! Merry Christmas to you and Cody, and happy memory-making. Awwwww! What an adorable flashback! You can't help but smile at photos like this one! That is priceless! Looks like Santa was holding on to you for dear life. Priceless capture. Poor Santa as it looks like you have a good set of lungs. oh my! The lil' gal is afraid of Santa. OMG!! Both their expressions speak volumes!!! Love this!! Kinda of a rite of passage of childhood! I guess she has said it all for some of us. Jessica~! OMG how cute are you. Happy New Year!!! I hope your Christmas was wonderful. Enjoy these amazing holidays. Hi Jessica you one of the winners of the Poddy awards 2008 for the photo of the year. Too funny--that photo is a keeper. Hope you had a great Christmas! I MISS YOU DEAR>>>>HOPE ALL IS WELL!? CLASSIC!!! He scared me too!